I’m not one for making New Year’s resolutions, but I’m certainly not oblivious to the fact that I could lose a few pounds. So I’m doing my best to reduce portion sizes and make smart choices. That said, there are some things that I just can’t do without. Bacon is one of those things. But I bet y’all already figured that out. 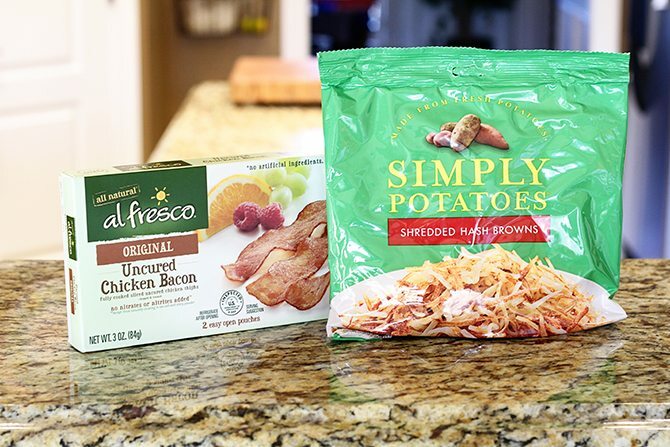 So when my friends at Simply Potatoes® asked me to use al fresco Chicken Bacon in a recipe, I honestly wasn’t really excited. I mean, I get that it has 70% less fat than pork bacon and all, but every attempt I’ve made to enjoy non-pork bacon over the years has failed miserably. So, the other day I pulled out one of the boxes of bacon to get an idea of what I was in for. It’s fully cooked so it only needs a little time in the microwave or about 45 seconds in a hot pan. I opted for the pan method. Y’all, it literally blew my mind. This stuff is amazingly delicious and tastes absolutely nothing like my non-bacon bacon attempts in the past. 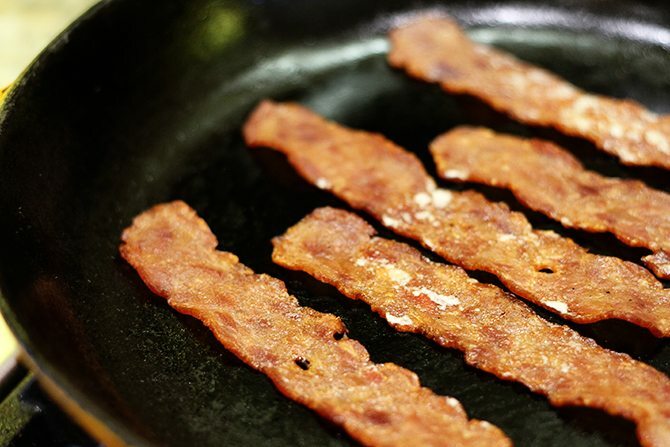 It’s smoky, crispy, and salty – just like bacon. Sure, the texture isn’t exactly the same, but considering how much better it is for you, it’s totally worth it. 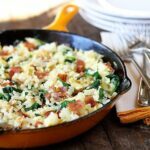 After trying it, I decided to work it into a breakfast skillet that I cook every now and then for the fam jam. It’s the perfect vehicle for the chicken bacon and using Simply Potatoes Shredded Hash Browns makes it a cinch to put together since there’s no peeling or shredding to do. And they’re great because they’re made from fresh, never frozen potatoes. Start by heating a large skillet over medium heat. Add the bacon to the skillet and cook it for about 45 seconds. Then remove it, cool, and chop it. Add about 2 tablespoons of vegetable oil to the skillet. Once it’s hot, add in the hash browns. Stressing them down slightly in the pan allow for more contact with the pan and gives your more crispy brown pieces. 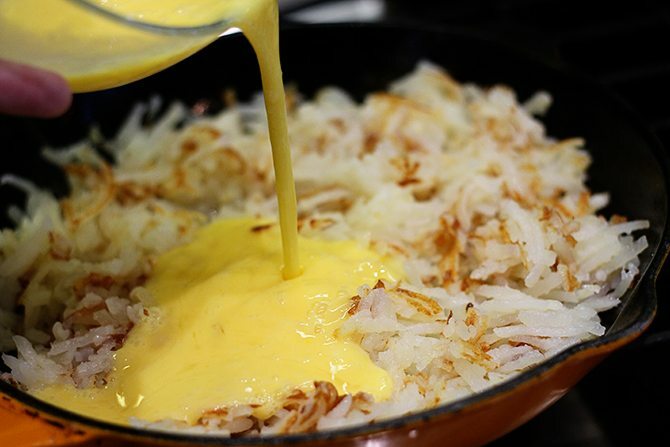 Cook for 7 to 8 minutes, then drizzle the remaining tablespoon of oil and flip the potatoes over to cook the other side. 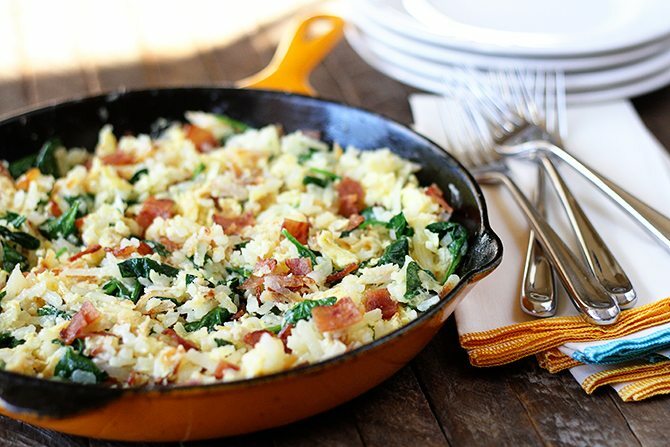 Once they’re cooked, pour in the scrambled eggs and add the spinach. Stir and cook until the eggs are cooked through and the spinach has wilted. Stir in the chopped bacon and then add salt and pepper to taste. See, easy peasy, lemon squeezy! Not to mention super delicious and quite but lighter thanks to that chicken bacon! My friends at Simply Potatoes are great about offering up an amazing prize with each of these posts. This one is no exception. You could win a huge Lodge Cast Iron Skillet simply by entering below. I have this exact skillet and use it all the time. Be sure to scroll to the bottom of the post to enter! 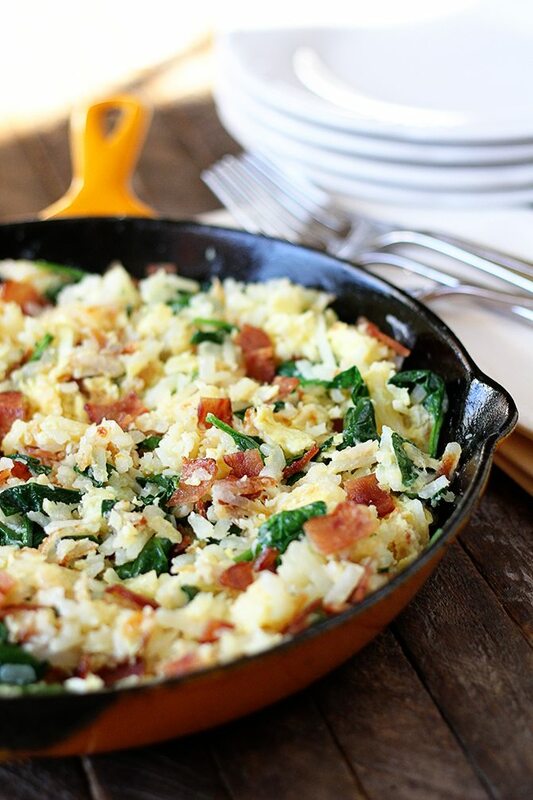 In a large skillet, warm the bacon by placing it in a heated pan over medium heat. Cook for about 45 seconds then remove and cool. Chop the bacon coarsely. 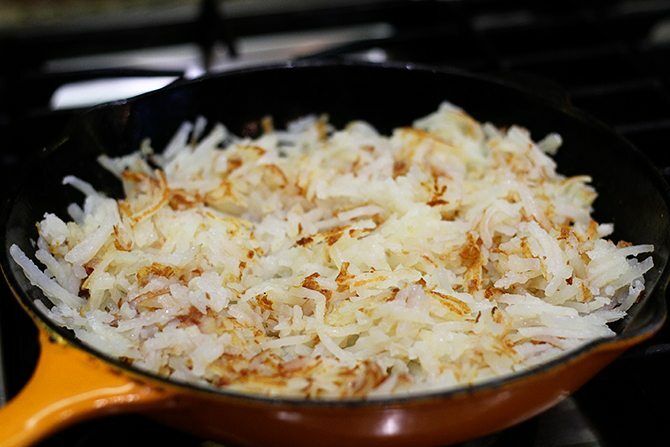 Add 2 tablespoons of oil to the skillet and add the hash browns. Press them lightly in the pan. Cook for 7 to 8 minutes or until starting to brown. Drizzle the remaining tablespoon of oil over the potatoes and then flip. Cook until brown and crisp. 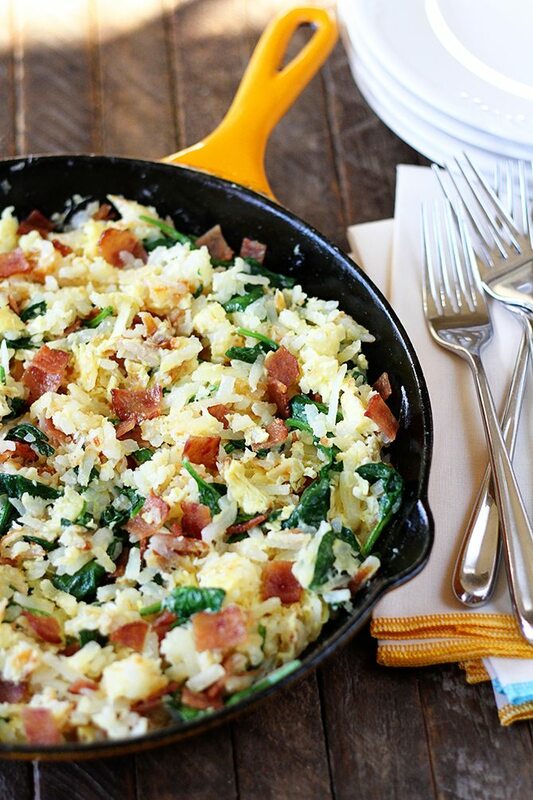 Add the eggs and spinach to the hash browns and stir to combine. Reduce the heat to low and stir constantly to cook the eggs through. Stir in the chopped bacon and cook until the spinach has wilted. Add salt and pepper to taste. Serve immediately. Looks great, Stacey. I was wondering about the calorie count. Did I miss it? Thanks! No, I don’t have that figured. I don’t normally include that info. I use chicken & turkey bacon ALL the time (not for diet reasons but faith reasons) and I am ALWAYS looking for new ideas to use it. You hit a HOME RUN with this one. Just finished eating and OH BOY….AH- MAZE-ING!! Thank you so much! Looks yummy and I would love to the skillet! So glad to find out about this bacon. It is the best non pork bacon I have had. I skipped the first step and just added the bacon with the eggs and spinach and I added a little cheese. My only change would be to add the spinach a minute before the eggs. The eggs were basically done when they hit the pan and the spinach took a little longer so my eggs were a little over done. We enjoyed it tonight as a breakfast for supper. 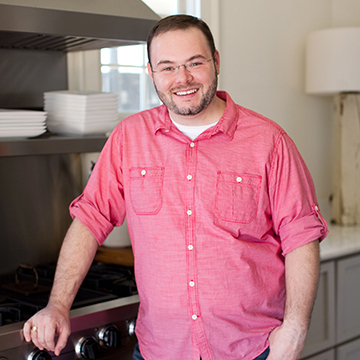 I love breakfast for supper – it’s one of my favorite meals! I really thought this bacon was far better than any non pork bacon I’ve had! Glad to hear you enjoyed it too! I really love eating breakfast anytime for any meal. I am diabetic and am always looking for a great recipe that I can get protein and very little carbs. 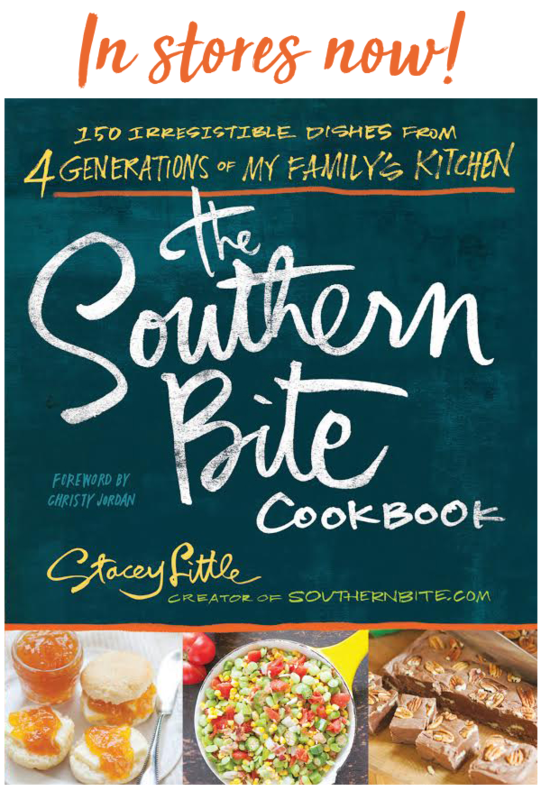 I plan on trying this recipe right away! !